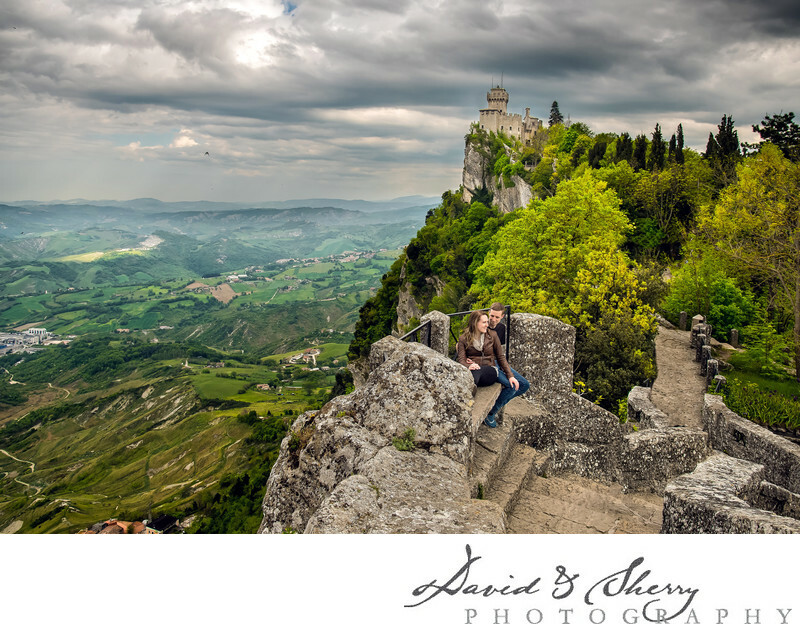 San Marino, Italy is a beautiful location for pre-wedding, engagement and wedding photos. Perched on the ancient hilltop are two castles which look out at each other and are grounded at the edge of a steep and high cliff giving it’s incredible beauty. Taking photographs for weddings at destinations as beautiful as these is one of the things we love most. Couplescapes on historic and gorgeous locations such as these makes our job an absolute joy. Ed & Kate were our pleasure to photograph here, two people whose marriage we took pictures at several years ago joined us on a recent Couplescape Tour of Italy where we climbed the hills of San Marino to capture some beautiful romantic photos in the valley between the two castles. When you stand on this mountain you feel like you are on top of the world. The same feeling you have when you are with the person you love, during a time of vacation and relaxation in a place as beautiful as this. We were pleased to create this portrait for Kate & Ed as it encapsulates the love and romance they share in a place equally beautiful. Springtime in Italy is a perfect time of year for destination pre-wedding photography as the amount of tourists is low, giving us the ability to use popular destinations without the distractions of many people in the photos. Bring us along anywhere in the world to capture beautiful landscapes to hang on your wall, and the personal touch of being part of your artwork.